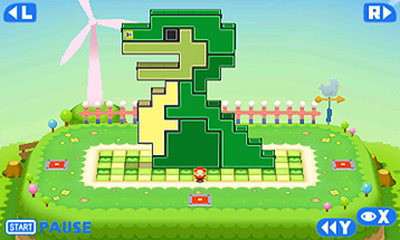 Mallo's Playtime Plaza has 100 great puzzles for players of all skill levels! Looking for a challenge? Then come on over to Polly's Sculpture Square, where 50 animal and object puzzles await. Keep the fun going in Corin's Fortress of Fun, which packs in 50 action-packed puzzles filled with special objects, like manholes and even enemies - a series first! 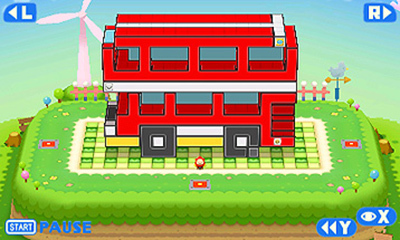 Stretchmo is as solid and endearing as the games that have come before it in the series; it's cute, colorful, and the perfect puzzle game to keep on your 3DS for dull commutes. 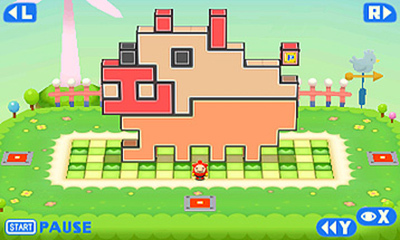 It inherits all the best parts of Pushmo and Crashmo and bundles them up in a package that is well suited to anyone, regardless of their series experience. Although it may not offer a groundbreaking change in the series, it distinguishes itself enough to be joyful in its own right. As an inexpensive downloadable title—again, the first few tutorial stages are free, and buying the four-pack of add-ons makes it ten bucks—I can’t help but say I enjoyed it, despite the repetition of what was necessary in each level. It looks nice, it handles well, it gives an interesting and twisty challenge, and it doesn’t feel as though I’ve wasted time like some games might. 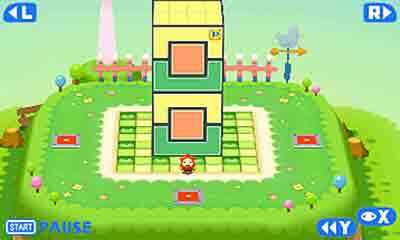 Stretchmo doesn’t reinvent the puzzle genre, or the series in which it exists, but it expands and evolves it in fresh and interesting ways. Fans of the series will find a lot to love about Stretchmo, with its new mechanics bringing a lot of life to the games. Puzzle fans might have trouble slogging through the multiple tutorials, but once they do they will find a fun and challenging experience waiting. While all of this is generally pretty great, there are a few downgrades in comparison to the previous version. 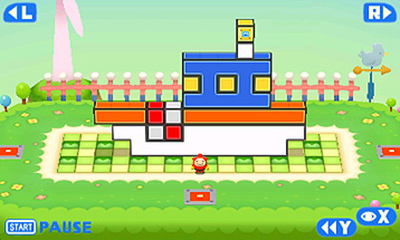 In particular, the Pushmo World Fair feature from the Wii U release is sorely missed. Although the idea of socially sharing your QR codes with one another is cool, I loved the ability to instantly jump in and casually browse through online creations, even if I didn't play all of them. In short, Fullblox is an experience that is totally worth getting for one or all of its modes. Each player can find the mix that fits them the best; a more relaxed experience or perhaps something more intense with a more difficult challenge. ...Fullblox offers the option to buy as much or as little as you want; you can grab just one mode and the editor, or you can enjoy the complete package for a fairly reasonable price. This is another example of Intelligent Systems' knack for creating deep and involving gameplay using the simplest of mechanics. This is a fun puzzler that continues the superb work of its predecessors, although there could have and should have been more free to play levels to give potential players a little more incentive to purchase those packs. The new mechanics breathe new life into the Pushmo series, making Stretchmo the most varied and interesting entry in the young series. While part of me still prefers the focused, no-nonsense challenge of Crashmo, Stretchmo is fantastic, arguably the strongest Pushmo game yet. Fullblox es un juego de puzles que se convierte en pura adicción desde la primera partida. La mecánica de juego nos invita a pensar una y otra vez cómo podemos solventar el acertijo de turno para llegar a nuestra meta, y el progreso del título va claramente de menos a más, siendo los niveles difíciles una auténtica maravilla del diseño que satisfacen, una vez solucionados, como pocas cosas.